Surrounded by soft lighting and beige carpet, the three microphones pass back and forth across the tabletops as the committee members address one another in the calm tone of an extended sigh. “The administrative errors that have been made have since been fixed,” says one member. Another asks about traffic mitigation. Soft lighting bounces off the white ceiling. Starbucks coffee marinates in urns beside a tray of supermarket cookies and a small fort of pizza boxes. On the wall, two projector screens display a screensaver. Then the public comment period begins. She’s referring to the proposed expansion of Swedish Hospital’s Cherry Hill campus, which is co-owned by the nonprofit hospital and by the Sabey Corporation, a private developer. The Community Advisory Committee (CAC) she’s addressing has spent the better part of two years considering the expansion proposal (called a Major Institution Master Plan, or MIMP), which essentially asks the city for special zoning permissions on account of the hospital’s good deeds. The neighbors of Squire Park aren’t buying it. “This is just absurd and should be rejected out of hand,” says resident Murray Anderson. “Overwhelmingly, the community feels that this project is out of scale with the neighborhood,” I’m told later by Katie Porter, CAC chair and Squire Park resident. Neighborhood opposition to the expansion, grounded in fears of congested traffic and what resident Joanna Cullen calls “monolithic structures,” is climaxing as the CAC approaches its final votes on whether and how Swedish/Sabey is allowed to expand. Porter says she expects the CAC will issue its recommendation in March. After that, the City Hearing Examiner will decide what expansion, if any, to allow. 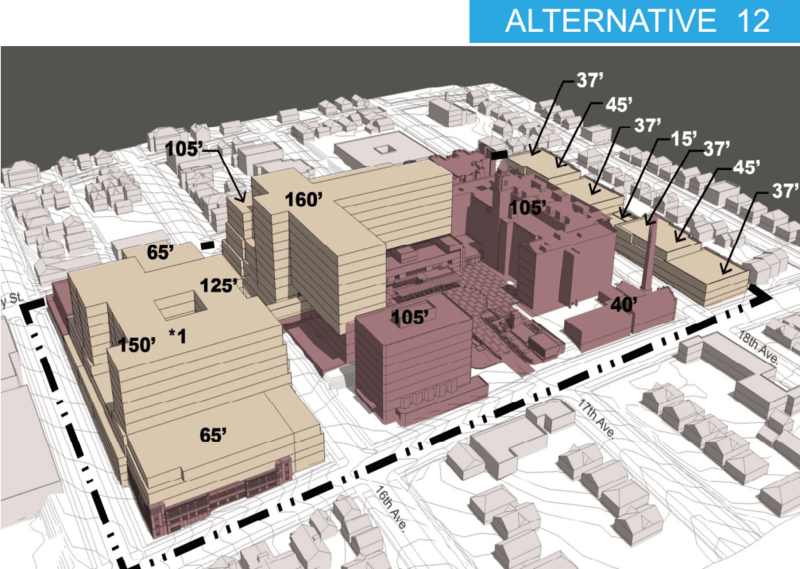 It’s been a long road for the CAC members, who have managed to whittle down the size of the hospital’s proposals (which initially would have (PDF) more than doubled the heights of some buildings) but have not achieved anything like stakeholder consensus: Swedish and Sabey want an expansion, and residents don’t. Porter says she hopes the unavoidable problems (PDF) the expansion will bring to the neighborhood — mostly related to increased traffic and the aesthetics of gigantic building — can be counterbalanced with other benefits. But those benefits are not yet well-defined. “Frankly,” she says, “we have not seen much from them in terms of how this is going to improve our community. The CAC’s next meeting will be at the Swedish Cherry Hill campus on Thursday, January 15, from 6:30-8:30 PM. This entry was posted in News, etc. and tagged development, squire park by CaseyJaywork. Bookmark the permalink. Amazing how entitled these people are. They’re less than two miles from downtown, and only a few blocks from other high rises and they expect nothing to change ever. Seattle needs to stop listening to nimbies who’s only concern is their property value and their view of whatever, the latter is just a lame excuse to gain the sympathy of other nimbies anyways. The city is in need of a citywide up-zoning. You may be right about the need for citywide upzoning, but that’s for the city council to decide, not Swedish/Sabey or those of us who are tired of NIMBY concerns getting more play than they deserve. Swedish has not been a great neighbor, nor do they engender trust or generosity. For example, they aren’t in compliance with pre-existing obligations to reduce car trips to and from their facility on our local, residential streets. We have blood lab vehicles speeding through our residential streets and Swedish clients making it impossible to park in our neighborhood. Maybe if Swedish lived up to one single commitment they’d made to the community, the local residents would have a different perspective. Of course, the city doesn’t do its job of enforcement either, so there’s plenty of blame to go around in this dysfunctional relationship. Back to your point – does UP have to be ugly? Do residential neighborhoods have to accept encroachment from every large institution with no say on how? Do you know what it’s like to go through one of these CAC meetings let alone a whole process? The company is disingenuous, the city is bureaucratic and the only neighbors willing to engage, because the process is so painful, are the marginally sane. If you want more reasonable neighborhood participation, make the process and the possibility for a reasonable outcome a reality. Unfortunately, this is what democracy looks like. It ain’t pretty. But our neighborhood is still intact and we don’t need to change that. No offense to my neighbors, you’re all wonderful people. But anyone willing to put themselves through this nonsense is a little nuts in my book. My biggest complaint is its going to obscure the original main building with new enormous dumb boxes that only an architect could love. Hope the neighbors can wrestle some concessions. An expanded Swedish campus is definitely in Seattle’s interest, but it’s in Swedish’s interest too. They can come to the table. Incidentally- what is it about Hospitals that makes them such cruddy neighbors? They spend tons of dough on design, but they never seem to jibe with the neighborhood. Maybe Group Health on 15th gets a passing grade, but the rest of Seattle’s hospitals all seem to kill the neighborhood vibe. I am a Cherry Hill employee who also lives in the neighborhood and am really disappointed in my neighbors. Swedish is not some monster corporation; it’s a non-profit hospital that really does serve the community, and I am so proud to be a small part of the work that is done there. But here’s the deal: Swedish is running out of room. This expansion needs to happen if Swedish Cherry Hill is going to be able to provide quality care to our ever growing city. You would think that residents would view this as a positive thing but it seems that all people can care about is their view and dealing with a little more traffic (which frankly is going to be happening anyway as this city continues to boom). It’s really frustrating. Non profit? Explain please why, during a recent stay, I was charged $10,000/night for a shared room, and $16 for each pain pill that I later bought at a pharmacy for 33 cents each. Non profit. What a joke. I live on 19th ave just behind the hospital. To those who feel that we are worried about our views and a little more traffic I’d like to ask if you have been following this? One of the proposals that Swedish/Sabey introduced involved vacating my block. That means that I would lose my “view” because I would lose my house. Hard to worry about what’s in my backyard in that case. This isn’t far fetched either. My house was moved here in the early 80’s after Providence vacated the neighborhood and the neighbors won it back. Traffic is a huge issue in our neighborhood. The added capacity is going to classify most of the lighted crosswalks are going to be classified with an “f” rating. This neighborhood supports 3 schools where children are required to walk to school in the morning and home at night if they live within a mile of the school. Swedish/Sabey is smack dab in the middle of a mile of these schools. This rating on these lights are unacceptable and will cause accidents. I worry more for the unlighted intersections these (my) children need to cross. Also, for those worried about the limited space at the hospital why, Swedish could start by taking back all the space from LabCorp and the Northwest Kidney Center. Plenty of space there that could be used by the hospital. However you feel on this subject there is another meeting tomorrow 1/15/15 starting at 6:30 under the cafeteria at the hospital. Enter main entrance, pass Starbucks and Chapel – continue into the dining room down the stairs to A-level or take East elevator down to A-Level. Directional signs will be posted. Public comment is towards the end. Make your voice heard. Speaking only for myself, and as a direct-next-door neighbor of the proposed development, I am strongly in support of a Swedish/Sabey expansion at this location. That said, I am also strongly in support of my so-called “Nimby” neighbors. It’s not a black and white issue, folks. My neighbors want the project scaled back, and they want concessions. If it weren’t for their actions against the development, the plan would have been quite bloated (and swallowed up a whole city street). This is part of the process, and we shouldn’t take the passionate pleas of the neighborhood as being overly hyperbolic. It’s the way things happen, and in the end it will work out just fine. One point I haven’t seen discussed is the need for this type of healthcare facility in this location, particularly the Neuroscience emphasis. With Harborview and Virginia Mason close by and University Medical Center easily reached this seems like a duplication of resources. Working in the healthcare field, I’m sure there are areas of care that could use the limited dollars. This doesn’t even address the overwhelming scope of the project which is out of place in this neighborhood. I think that is a very good question. Swedish/Sabey talks about being at capacity yet it appears that they spend a huge amount of money on advertising for new patients. They have several television commercials, one with a local sports figure who likely commanded a huge price. They constantly mail advertisements to my home. It doesn’t add up. There is also the trend that people spend less time in the hospital after procedures. That is actually a good thing given that hospitals are so expensive and they present a huge risk for infection. If they were totally focused on the public good, they would be looking at ways to have better outcomes and release patients more quickly at a reduced cost. It makes me wonder if the expansion is part of a plan to expand their market share and consolidate power. They are now part of Providence Health System, so they likely do have an agenda of expanding faith based care. Having a Neuroscience clinic at Swedish is not necessarily a duplication of resources. Some degree of competition between medical centers is a good thing, because it results in more innovative approaches and improved outcomes for patients. What does need to be consolidated, though, are things like radiology services (MRIs especially)….they are very expensive to install/maintain, and are a huge part of health care costs. There are several centers for cancer treatment in Seattle (Swedish, UW, Seattle Cancer Care Alliance, etc) and all of them have substantial numbers of patients. The people who are complaining whiner NIMBYS if we are against the plans Swedish/Sabey have offered to date. I feel pretty confident that most people living in the CD aren’t trying to protect their views. All one needs do is look at the proposal put forth and walk the blocks this project will abut. Additionally the current hospital has yet to meet their transportation goals, meaning the employees of the hospital and facilities (labs, admin etc) aren’t taking public transportation to work in the % Swedish promised. I live north of Union and it is fairly common to see hospital workers getting into their cars and moving them closer in after the restricted parking time is over. Look at the number of unique trips Swedish estimates. 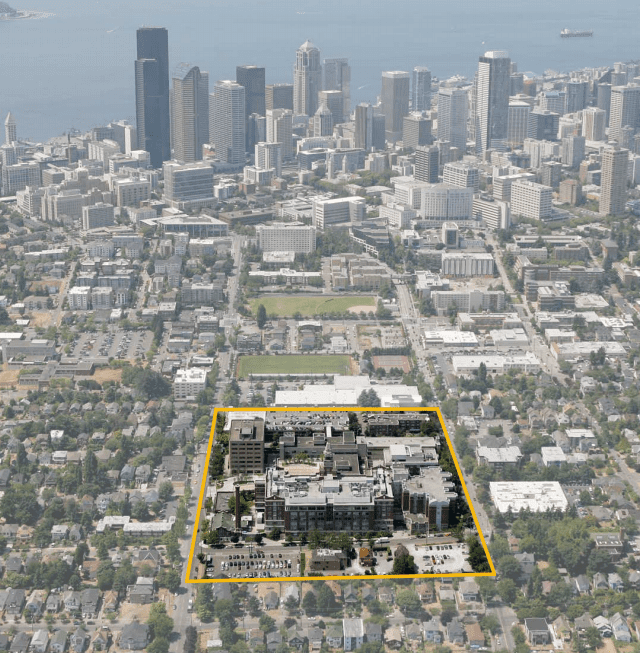 This development, combined with Seattle U, the expansion of SAAS, the change of TT Minor to a high school will create traffic havoc in a neighborhood that hasn’t seen the city do much try to alleviate congestion. It is not uncommon to wait for 10 cars to go by before one stops for a pedestrian, yet the SPD routinely ignore this. Now quadruple the number of drivers for this project alone. Perhaps this massive project would seem manageble if the street car was coming closer, but with no plans for a massive re-routing of transit this development will swap the neighborhood.